The theme of this post is “Pairings”. A company with a unique product and a food website with lots of followers have paired together to showcase a product that is also a pairing of another kind. I am a blue ribbon blogger at a website called eRecipeCards. eRecipeCards is the brainchild website of a fellow blogger. Dave has created a food community in cyberspace. It is a place to share; a place to post favorite recipes, and a place to discover favorite recipes like we do among our own circle of friends and family. Recently, eRecipeCards has paired with a company called O Olive Oil to sponsor a contest utilizing their flavorful oils and vinegars. I am one of eight bloggers chosen to submit recipes to the contest. But before the recipe post, a little background on the company is called for. We can all relate to the first time we tasted an extraordinary food pairing; balsamic vinegar with goat cheese and walnuts, chicken in riesling with fresh tarragon, pork with prunes and Armagnac. There are some pairings that just work and make us say “Oh yes!” Flavor combinations like these, that play off of each other while still showcasing each component, are to be savored and repeated. ﻿ While living in Italy, Greg and Marta Hinson spent some time in Abruzzese. While there in the bucolic countryside, they came across an olive mill where native olives and lemons were being pressed together to produce a citrus flavored olive oil beyond compare. It was a revelation I am sure. The Hinsons returned to California with the citrusy olive oil foremost in their memory of Abruzzese. It was definitely an experience to be repeated and the Hinsons began the company called O OLIVE OIL. Northern California is replete with Mission olive groves and citrus orchards. Today, O OLIVE OIL gathers California Mission olives and citrus from small organic farms and presses them together in a state of the art olive press. Each batch is timed to the season of ripeness. December is press time. Whole lemons, oranges, grapefruits and limes are crushed in the press with the olives. The result is that extraordinary pairing that knocks your socks off; a pure mellow olive oil with the tart freshness of citrus. 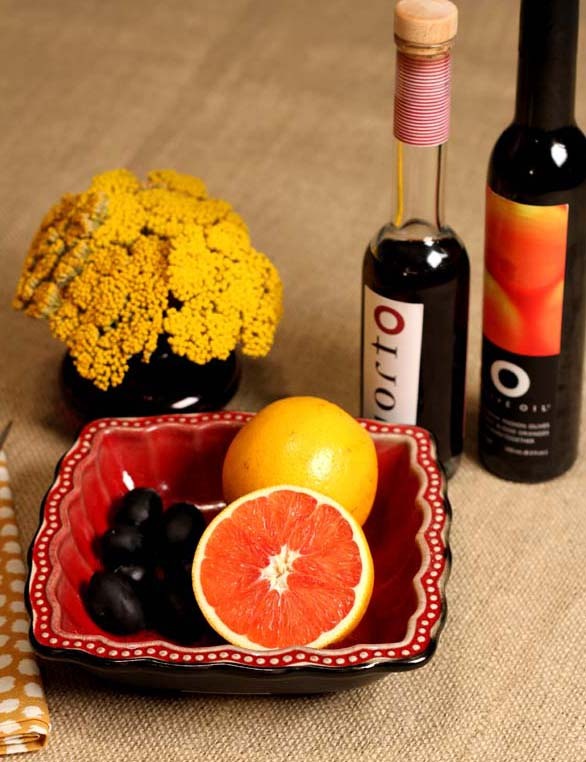 Not to rest on their laurels, in 1997 O OLIVE OIL added a line of vinegars to their offerings. Relying on wines from the Napa Valley, they barrel-age the wines in a time-honored tradition. A natural vinegar culture is added to the wines in the wooden barrels and left to develop slowly – no rush, no artificial infusions. It can take up to four years for the vinegar to be ready. The resulting vinegar is full-bodied and lusciously sweet. 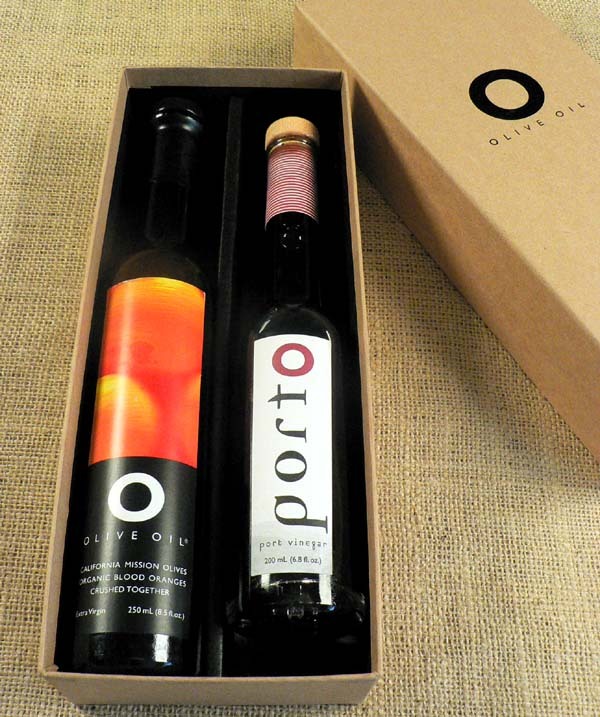 O OLIVE OIL sent each of us the olive oil and vinegar of our choice to use in developing our recipes. 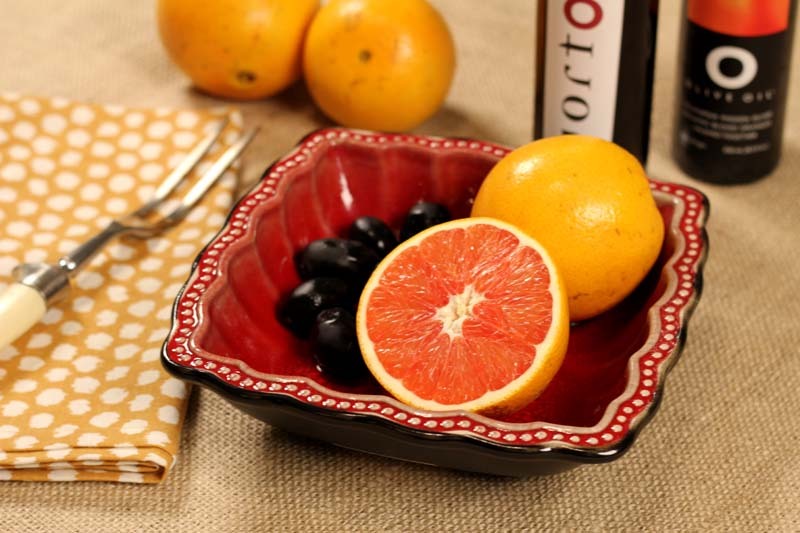 I chose the Blood Orange Olive Oil and the Porto Vinegar. Before beginning work on a recipe, a taste test was in order. The Porto Vinegar, made from Napa Carbernet grapes, is dark in color which immediately put me in mind of a balsamic vinegar. I expected that sweet rich taste that is characteristic of a good balsamic, which was there, but there was a difference. 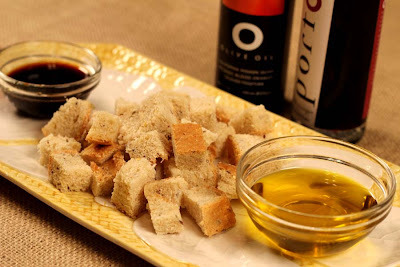 In a side by side test of Porto Vinegar and a balsamic vinegar from Modena, Porto vinegar had a brighter taste. There was a musky taste to the Modena vinegar that was too cloying. The Porto vinegar had a sweet and tangy punch with just a hint of smokiness, I look forward to using it in many of my recipes. I know I’m waxing poetic about O OLIVE OIL, but it’s because I’m a huge fan of their products. In a world where most of our food is mass produced, a company run by foodies who care about the integrity of their ingredients will always get my vote. But producing quality food is not inexpensive. I have said it before on my blog, I would much rather pay more for an organic free-range chicken than buy a mass-produced bird for 59 cents a pound. If you agree with me and appreciate companies who are trying to produce healthy options,click this like button for O OLIVE OIL. Likes on Facebook mean a lot to companies and get them strong recognition in the food industry. In addition, O OLIVE OIL is offering a 20% discount on all of their products through December. Free Shipping is available on orders over $60.00 (after discount). Just use the special code established just for us when you check out. The code is e-recipecards. Go to their website for a list of all of their oils and vinegars. But if you do nothing else, at least like them. They deserve it. A special thanks to eRecipeCards for sponsoring this contest. The Web Maestro of the site understands what it is to be a blogger. Have you ever been rejected by FoodGawker? I have ….on many occasions. But I have never been rejected by eRecipeCards. Dave’s website is inclusive and encouraging to both new bloggers and veterans alike. He wants nothing more than success for all bloggers. What a great site with thousands of recipes for all of us to enjoy. After much thought and many ideas, I have come up with a recipe that I feel showcases the uniqueness of the O OLIVE OIL Blood Orange Oil and the Porto Vinegar. I hope you agree. Posted on December 1, 2011 at 4:27 am.